In Gita Adhyay 17 Shlok 1, Arjun enquires that, what is the state of those who perform sadhna (worship) opposed to the scriptures with faith? Satvik, Rajsi or Tamsi i.e. 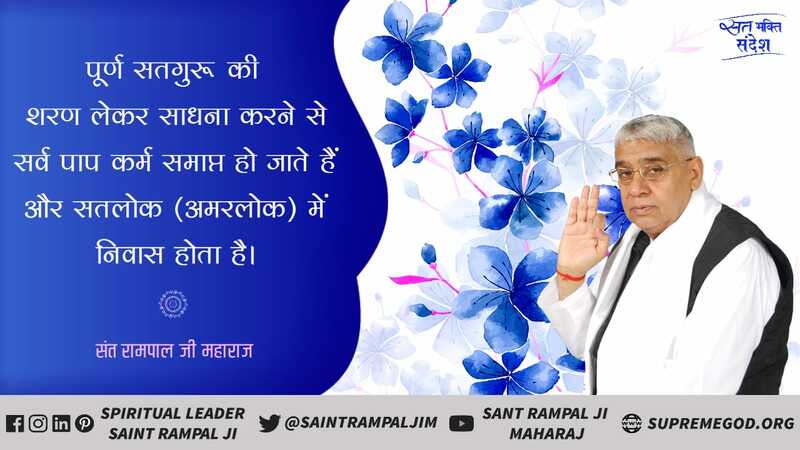 what is the nature and conduct of the worshippers of the three gunas (Rajgun-Brahma Ji, Satgun-Vishnu Ji, and Tamgun-Shiv Ji) and the gods-goddesses lower than these? Translation of Adhyay 17 Shlok 6: - Know the ignorants, who trouble (torture) me and the heads of the living beings (Brahma, Vishnu, Shiv, Prakriti-Aadi Maya and Ganesh) dwelling in the body and the Purna Parmatma situated in the heart in the body who is positioned like a thread in a cloth, to be of demoniac nature, who do not perform sadhna according to the opinion (injunctions of the scriptures) and adopt whimsical way of worship and conduct. 2.Swaad Kamal (Chakra),- in which live Brahma and Savitri. This lotus has six petals. 3.Naabhi Kamal (Chakra) – Above the Swaad Chakra, in front of the umbilicus along backbone, is Naabhi Kamal. God Vishnu and Lakshmi live in this. It has eight petals. 4.Hridya Kamal (Chakra) – Above the Naabhi Kamal, behind the heart is a Hridya Kamal. God Shiv and Parvati live in this. This Hridya Kamal (Lotus / Chakra) has twelve petals. 5.Kanth Kamal (Chakra) – Above the Hridya Kamal is Kanth Kamal, which is near and behind the throat, stuck to the backbone. In this, lives, Prakriti Devi (Mother Ashtangi / Durga). This Lotus has sixteen petals. 6.Trikuti Kamal (Chakra) – Above the Kanth Kamal is Trikuti Kamal. It has two petals (one is white and the other is of black colour). The Purna Parmatma lives in this. Like the sun even when situated far away keeps exerting its influence on the body of every being, but is visibe only with eyes. Here, we have to infer in this way. And the Purna Parmatma also lives in the inner-self with the soul. Like, a thread occupies the whole cloth and there is also other embroidery which is present only in some part. 7.Sahansrar Kamal (Chakra) – Above the Trikuti Kamal, where one keeps a top-knot, in that place on the inner side is Sahansrar Kamal where Jyoti Niranjan (in form of light in thousand petals), Kaal (Brahm) himself lives. This lotus has one thousand petals. Therefore, it has been stated in this Shlok that those with demoniac nature, who do not perform scripture-based sadhna, torture me and the chiefs of the living beings, Brahma, Vishnu, Shiv, Ganesh, Aadhya (Prakriti) dwelling in the body and the Purna Parmatma who lives inseparably with the soul (like smell and air). I cast them in terrible hell. All the living beings are under the control of their instincts. Whatever one is from inside, he has devotion in similar religious practices. Those with Satvik nature worship other gods and Shri Brahma Ji, Shri Vishnu Ji, Shri Shiv Ji and especially worship Vishnu Ji as the favoured deity. Those of Rajas nature worship the Yakshas and demons and also the above-mentioned three gods. But those dominated with Rajogun worship Brahma Ji as the favourable deity. Those with Tamas nature worship the ghosts, pitras (deceased ancestors) and also the three gods, Shri Brahma Ji, Shri Vishnu Ji and Shri Shiv Ji, and the revered deity of the individuals dominated with Tamogun is Shiv. Like, Ravan worshipped God Shiv and by doing sadhna of a lower level than this i.e. by worshipping ghosts and pitras, straightaway go to hell. 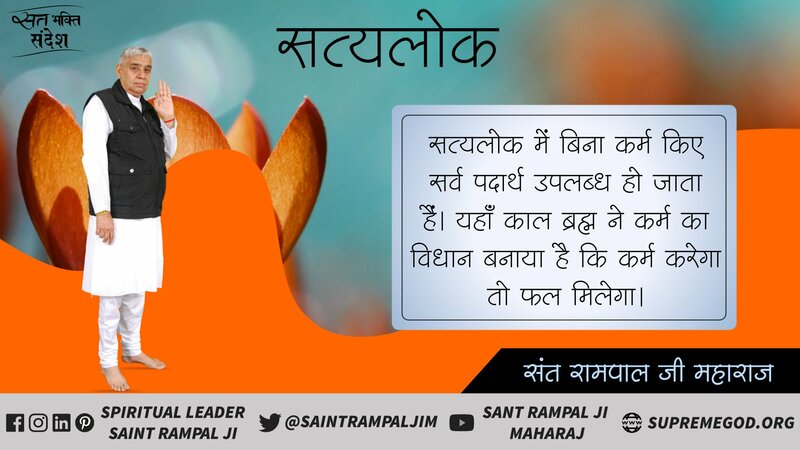 Those who do sadhna contrary to the ordinances of scriptures, those evil-souls torment me and also that Supreme God and know them to be of demoniac nature. They also like food according to their nature. The Satvik persons like simple food like, lentil, milk, yoghurt, ghee, butter, honey, sweet fruits etc and the Rajsi persons like bitter [alcohol, paan (betel leaf), hukkah], sour, excessively salty, excessively hot-dry, spicy-hot etc. food, which are the cause of many illnesses. The Tamsi persons like rotten, tasteless, impure (meat, alcohol, tobacco etc. ), stale and leftover food. Bhakt Samman beheaded his only son Seu for his Gurudev Ji. This is the Tap (austerity/penance) of a scripture-based devotee related to his body. Like, Kabir Sahib used to give description of true sadhna. 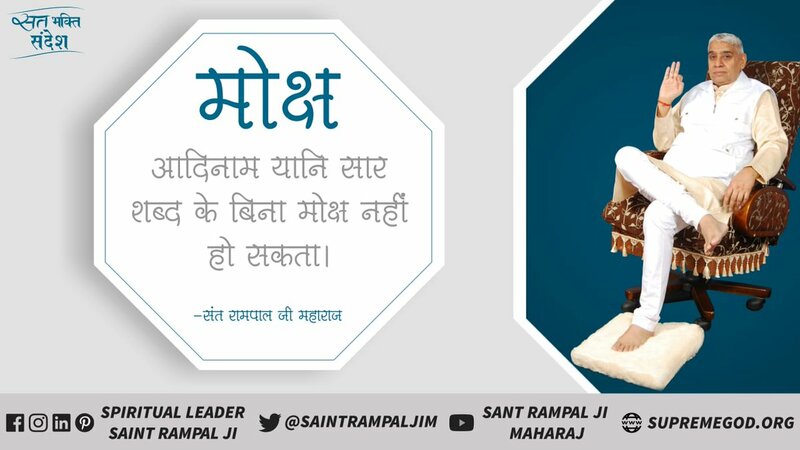 He used to describe the false sadhna (of gods-goddesses, Brahma, Vishnu, Mahesh, Mata Masaani, idol-worship) as incomplete and a hinderance to salvation. It is a heinous sin to drink alcohol, eat meat, and consume tobacco. Hindu – Muslim, both are living beings of one God. God is not present in mosque or temple. God is attained within the body by taking naam from a Complete Saint and doing scripture-based sadhna. Like, cow, buffalo, sheep, goat or any other female mammal; milk is obtained from her body only. A female with no offspring has no milk in her body. But when that female becomes pregnant and then delivers the offspring, then milk is obtained. 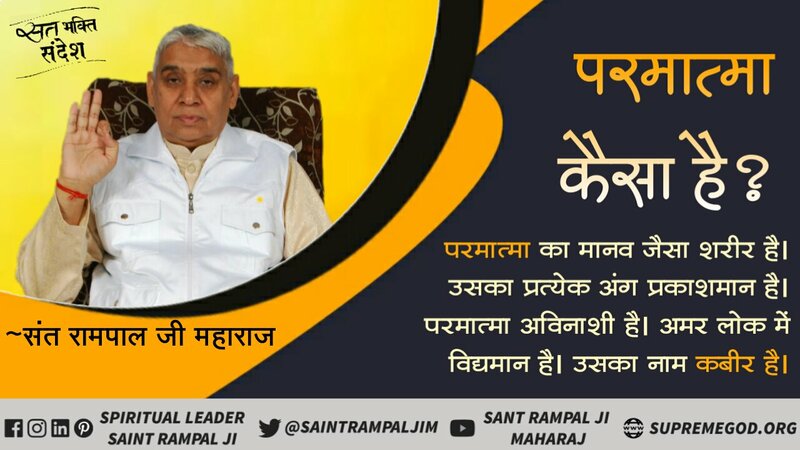 Similarly, when this human being obtains naam from a Purna guru (Tattavdarshi Saint) and does sumiran and remains within the bounds of the Guru Ji throughout life, then offspring of bhakti develops in him. Then he attains the benefit (milk) obtained from God. God cannot be attained anywhere else. Even though Supreme God’s power is all-pervading in invisible form, like, sun’s light and warmth exert their influence on all places during daytime, similarly, the Supreme God, while residing in form in Satyalok, is also present in house, field, temple, mosque etc, but He is not giving any benefit to the living being. The purport is that the light and warmth of the sun gives benefit according to its law. In winters, it is not able to give its full warmth and for meeting its need, fire is lit, or heater and air conditioner have to be used, or warmth is obtained by wearing thick and woollen clothes. Likewise, we were obtaining the complete benefit of that Purna Parmatma in Satyalok. Now because of having come far away from that Supreme God, we have come in colder regions. To obtain some of His qualities, we will have to adopt the same means which can protect us i.e. by abandoning the ordinances of the scriptures (the above-mentioned actual means of producing warmth), there is no benefit of using other measures. (Evidence is in Holy Gita Adhyay 16 Shlok 23, 24). When a distressed person goes to a saint (a devotee who has made God to appear / God-realised saint), he becomes happy by his blessings. There, he found God in that saint i.e. 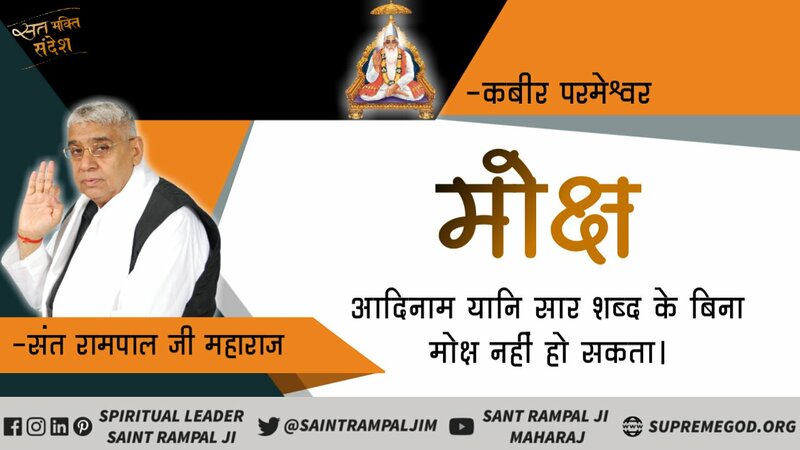 that Complete Saint/ Purna Sant granted him the means (scripture-based sadhna) for producing warmth, by which he obtained the benefits of God’s qualities because God has these same qualities. There is no order of consumption of meat, alcohol and tobacco in any religion i.e. it is strictly prohibited. Those who worship god by cutting a goat, they are not doing bhakti, rather, are becoming entitled to hell. 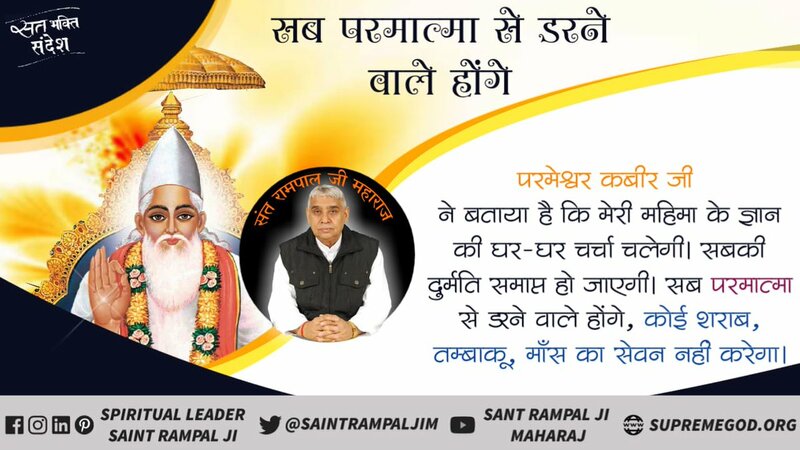 Infuriated by these true talks, tehse fake contractors of religions, the so-called Mullas, Kaaji and Pandits caused great trouble to Kabir Sahib on his true expositions. At one time, put Him in boiling mustard oil. At another time, put him before a murderous elephant etc-etc. this is known as tap (penance/austerity) related to speech. The essence of Adhyay 17 Shlok 21 and 22 — In this God has described how the tap and yagyas are performed and what are their types and rewards. Because the Sat Sahib (True God – Purna Brahm) only gives the benefits of yagya, charity and tap. Therefore, it is said that the action done for the sake of that God (Param Akshar Brahm) is true (Sat) and is the giver of complete salvation. The action done for the sake of other gods (Brahm – ParBrahm) is not the giver of complete salvation. The God superior to Brahm is ParBrahm, but the complete giver of happiness, and who liberates completely from birth-death is only God Purna Brahm. He is Sahib Kabir. He only is called Sat Sahib. 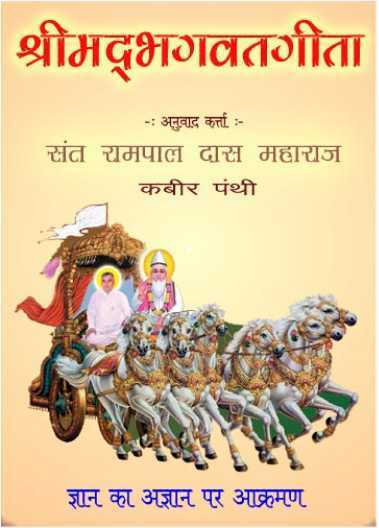 Important: - Only the Tattavdarshi Saint mentioned in Gita Adhyay 4 Shlok 34 correctly tells about the Tattavgyan of Purna Parmatma; ask him only. 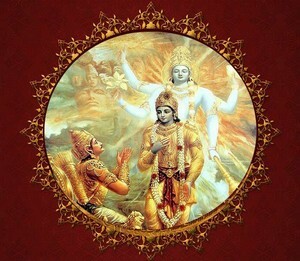 I (God, the narrator of Gita) do not know. Its evidence is also in Gita Adhyay 15 Shlok 1 to 4. 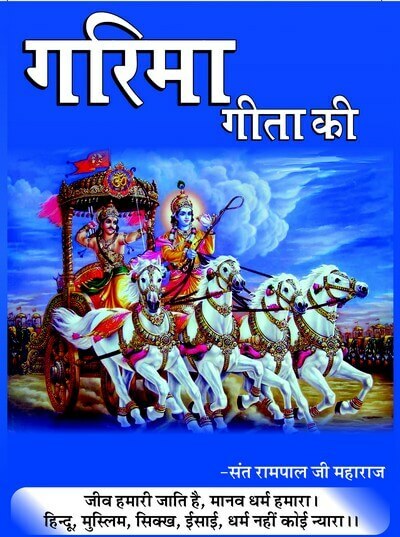 Therefore, understand the essence of Gita Adhyay 17 Shlok 23 to 28 here. In Adhyay 17 from Shlok 23 to 28, it is stated that for attainment of purna Parmatma, Om'/ ॐ - Tat' - Sat', these are the three naams. Om' mantra is attached to mantras used in sadhna upto Brahm; otherwise, that speech (mantra) is inactive. Like, ॐ Bhagwate Vasudevay NamH, ॐ Namo ShivayH etc-etc. 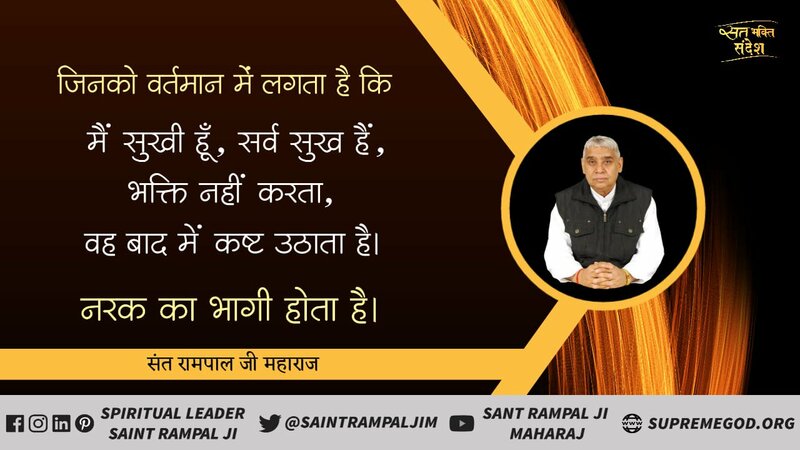 This jaap (is upto Kaal-Brahm and for obtaining benefit from the three gods, Brahma Ji, Vishnu Ji and Shankar Ji, dependent on him) is only upto attainment of heaven. Even then, because of being opposite to the injunctions of the scriptures the above-mentioned mantras are useless, though these mantras may yield some benefits. The meaning of Tat' naam is that the sadhna of Superior God (Akshar Brahm) ParBrahm is one tat' mantra (coded). Its jaap is done after taking it from a Purna Guru. To do jaap oneself, or after taking from an unauthorised person is also futile. This ‘Tat (coded)’ mantra is a special mantra for attaining God. Therefore, it is said to be superior to ‘Om'’ mantra, and the ‘Sat'’ jaap mantra is of the Purna Parmatma (Supreme God) which is added to the Saarnaam. That leads to complete salvation/liberation. Satshabd is the symbol of ‘Eternal’. The intended meaning is that the jaap of Om' mantra is also supreme, but superior to this is Tat' naam. For attainment of every deity is, Tat (coded) shabd, and Satshabd is the symbol of Eternal; that is Saarnaam. But in Vedas and scriptures, neither is Tat' naam given, nor Satnaam. Only ॐ naam is given. 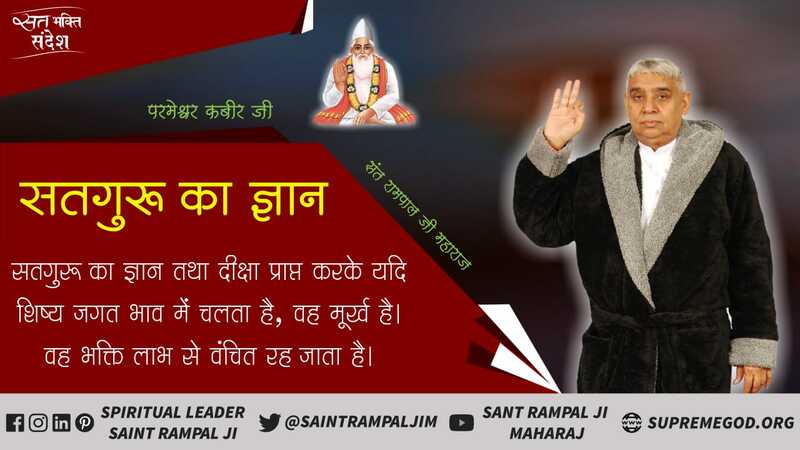 Respected Garibdas Ji, who is a disciple saint of Sahib Kabir, states that Kabir Parmeshwar told that I only have brought this Tat'(coded) mantra in this Kaal Lok, and have kept Satshabd (Saarnaam) a secret; it is only given to one who deserves it. Only a Purna Guru can give this Satshabd (Saarshabd). If other jaap, charity, yagya etc. are performed with faith and in accordance with the scriptures then whatever fruit (attainment of heaven for some time) is vested in them, one will get that. If they are not performed in this way, then even that fruit is not obtained. However, if Saarnaam is not obtained, then Om' and Tat' (coded) mantra are also useless. Some devotees considering ‘Om' - Tat' - Sat’ as the original mantra practice it repeatedly, but it is not good. A religious rite or jaap performed without devotion is neither beneficial in this lok, nor after death. Therefore, a religious act performed with complete devotion in accordance with the order of the Guru is beneficial. Whether bhakti is done of the lower gods or of the Purna Parmatma for attaining Satlok, that sadhna is only beneficial if it is in accordance with the scriptures and is done with full faith. In the aforesaid sacred speech, the great soul Respected Garibdas Sahib Ji, who attained God, is stating that those, who only limited to jaap of Om' and SohM mantra, are also in Kaal’s trap only. When Purna Parmatma KavirDev comes in all the four yugas, He leaves after Himself describing the whole method. Once, God Krishna (God of the three loks) came to Indraprastha (Delhi) to strike an agreement between Kauravs and Pandavs. At that time, Duryodhan was the king. But Duryodhan did not listen to God’s advice. In which Shri Krishna Ji had said that you may give half of the kingdom to Pandavs. War is not good. In the end, he had even said this that only give five villages to Pandavs. But Duryodhan did not even agree to this and said that even land equivalent to a needle’s tip is not available for the Pandavs. You have to dine at my (Duryodhan’s) place because it looks dignified for a king to dine at a king’s place. Shri Krishna felt that there is no devotion here, but only formality. With the excuse of going to urinate, slipped away and arrived at devout bhakt Vidur Ji’s house (hut). On being requested by Vidur to have food, God replied, “I am hungry. Bring whatever is cooked.” Saying this, himself serving saak (which was without salt) in an earthern bowl, started eating. Seeing this, Vidur Ji cursed his fate in embarrassment and also admires it. He cursed himself because he was thinking that, I am so poor that I could not even serve delicious food to God. Does Lord come again and again to this poor man’s house? And was admiring for the reason that, how fortunate I am that the Lord of the three loks has himself come to give his audience. Who knows an auspicious deed of which birth has arisen that I have been able to see Lord with so much love?